All inputs, EQ, auxes, panning and level controls are presented clearly, saving you time when creating your mixes and providing you with more time to spend on achieving the best sound. High quality 100mm faders combine with signal and peak LEDs on every channel and high resolution output metering places the operator in total control. You`ll find no unsightly screw heads anywhere on the M12 front panel to get in the way of your mixing, while a durable, multi-coat paint finish, ensures that a Spirit M12 console always looks as good as it sounds. The Soundcraft Spirit M12 features 12 mono input channels, four stereo inputs and four stereo returns. It also has a useful S/PDIF Digital output and Direct outputs ( pre or post fade ) on all mono channels. 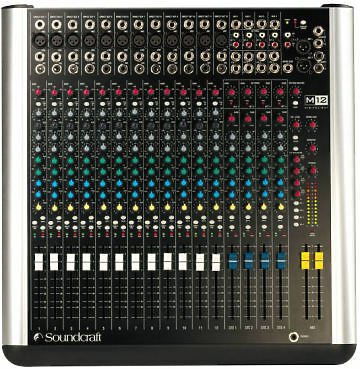 Hire the Soundcraft M12 Mixer from Procam. Best service and rental rates for the Soundcraft M12 Mixer and all cameras, lenses, sound, lighting and grip.